Signup and login conversion is the art of building new user intent and converting intent to authenticated users. Since every user starts out as a new user, this part of the user flow is very important to optimize. In order to actually grow your service quickly, signup rates must be high. In this post, I’ll talk about how to start growing signups and logins into a large growth channel. To summarize, in order to set yourself up for success, you must understand unauth user mix, understand how signups and logins interact, and build data tools. Then, I’ll talk about a few different areas of optimization you can try. There is a limited amount of product surface, so you have to find the right balance between these strategies to optimize for your user mix. Of course, your user mix will also change over time, so the optimal strategy will change over time. At new companies, the home page is usually a large driver of signups and logins, so let’s talk about the home page. If you look at some sample home pages such as Pinterest, Facebook, or Linkedin, you’ll notice that their home pages are very simple, and don’t tell you much about the product. It may be tempting to just copy what these high growth companies do, but this probably won’t work for most new products. This is because most people already know about what these big companies are and have probably signed up for them in the past, so most users fall into user categories dormant user and returning core user. If your product mainly receives these kinds of users to the home page, this is the kind of design you want: very prominent way to log in, and few distractions. You’ll notice that we do have a red tooltip that links to an education page, and that’s because we want to also cater to the few first-timers that may visit our site, even though they may not be the primary focus. One common mistake that occurs with new growth teams when growing signups is that they are grown without thinking about logins. At Pinterest, we didn’t start optimizing logins until a few years after we started optimizing signups, and realized that we missed out on some huge opportunities. Also, by optimizing just signups, there was a large amount of duplicate signups that were occurring. So, every unauth experiment should measure both signup and login changes. Sometimes, you will see results like signups up and logins down, or logins up and signups down, and if the magnitude is similar it usually suggests a duplicate account issue. Usually, you would want to go with the experimental group that has more logins but less signups to reduce duplicate signups. This is a very powerful tool for various reasons. First, it helps you keep track of historical changes that you can correlate to product changes or external events. For example, let’s say a certain page broke in a certain country. Without this charge, all we see is a signup drop, but it would be difficult to debug. By toggling the segmentation, we can quickly determine what country and page broke, and fix the bug. Next, it helps you easily determine opportunity sizes. For example, if somebody had an idea to increase conversion on a certain page, and the certain page didn’t receive much traffic, then maybe that idea shouldn’t be prioritized. Users who are going through signup flows might not have a lot of intent because the product is new to them. The slightest roadblock could possibly cause them to give up. One common problem here is too many steps. Frequently, products need a lot of information from the user to give the user a personalized experience, but sometimes people don’t feel comfortable giving information away, or feel like the signup process is too long. If your service requires a lot of fields just to operate correctly, consider breaking up the fields into multiple pages and make the user feel like they’re making progress. Another common problem is including a captcha. This causes some users to drop off because it is too much work and some captchas are actually pretty difficult. Instead, consider post registration filtering or requiring an email confirmation from a valid email. Every single line of copy in your sign up flow should be copy tested. I can pretty confidently say that over 80% of copy in Pinterest unauth has been copy tested, and the only ones that haven’t are usually in new features. 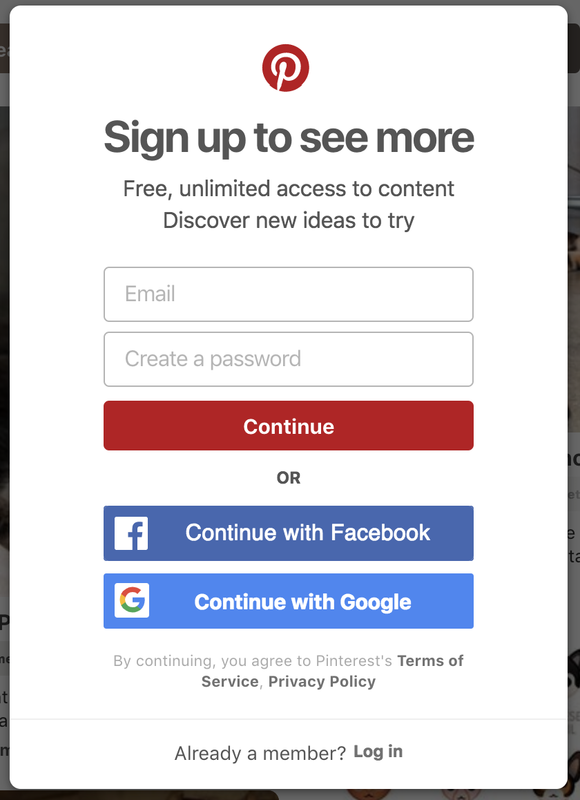 On this modal alone, we tested at least 6 parts: “Sign up to see more”, “Free, unlimited access..” “Continue”, “Continue with Facebook”, “Continue with Google”, “Already a member? Log in”. Copy testing must be a part of every growth strategy because it is a constant source of low cost, high impact wins. As you can tell from the previous screenshot, Pinterest uses social signups. In general, adding social signups will increase your overall conversion rate. However, there are some issues that you will have to deal with if you use social signups such as account duplication and decreased security. It’s good to have your social buttons to act as both signup and login buttons. When you get a response from Facebook or Google after they authenticate with those services, you should check if that user has an account already, and sign them up with those credentials if they don’t, or log them into their account if they do. Because social signup is so important to Pinterest, we even work with both Google and Facebook to suggest and beta test new authentication features. One then-new feature that I personally beta tested is the personalized “continue as” Facebook login button, which increased Facebook signups by over 30%. You definitely should try if you are using Facebook authentication. There are a lot of different timings that you can test with your signup upsell. You can pop it up immediately (although that probably won’t convert well), or after showing some content, or way down the line after the user has seen X articles. When testing timings, you have to understand how user intent changes over time as they browse through your product. For example, for a lot of users, they do not have enough intent to sign up right when they land on your page. That’s why modals that pop up immediately usually do not perform. As the user browses your products and learns more, intent can increase, but the longer you wait, the more users that leave. So, you want to find the sweet spot where users have enough intent but not that many of them have dropped off yet. This varies product to product, so I advise testing a variety of upsell timings. Signup and login conversion is an area of optimization that can have tremendous impact on your growth, and is vital to every growing company. In this post, we just covered the thought process behind user mixes, basic data tools, and a few areas of optimization, but because this is such a large area, more will be covered in later blog posts. Having worked on signup/login conversion for years, it’s interesting to me that the space continues to change and we continue to learn new things that increase conversion rate. It’s a constant learning process. I hope from this post you got a general sense about how to approach signup and login conversions!